Toxic synthetic chemicals that were heavily used in building materials a few decades ago continue to create a large risk for various construction workers breathing illnesses. According to the American Industrial Hygiene Association, the risk of occupational illness exists when workers come into contact with building materials that contain polychlorinated biphenyls or PCBs. According to a white paper released by the American Industrial Hygiene Association, these synthetic chemicals were used mainly in grout, caulking, expansion joint material and paint manufactured between 1950 and 1978. The health effects from exposure to PCBs have been well documented. 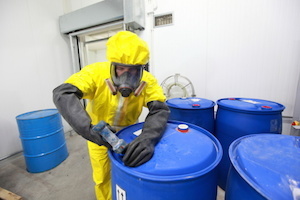 The Environmental Protection Agency and the Agency for Toxic Substances and Disease Registry have extensively researched and documented the impact on human health from exposure to PCBs. Some of those workplace health problems include reproductive damage and cancer. PCBs are also believed to cause hepatitis, liver enlargement, increased liver enzymes, tumors of the liver, fatty lesions and other conditions. PCB exposure is also associated with enlargement of the thyroid gland in a condition called goiter. There have been calls for protection of workers who may be exposed to PCBs and for more research into the long-term health effects, common modes of contact or exposure to these chemicals and ways to limit exposure. Most workplace exposure to PCBs occurs either through inhalation or touching of the chemicals.